God in Majesty, and additional scenes (France, Paris, c. 1465), this beautiful single leaf with a four-part miniature, was part of a Book of Hours now at the Pierpont Morgan Library (Ms. M. 1003), with this leaf originally falling between present folios 14 and 15. This work has now returned to its original book in the Morgan collection as Ms. M. 1207. The miniature depicts, in the top half, the Parliament of Heaven, in which God the Father sits on his heavenly throne in a golden and orange aureole formed by seraphim. One step lower sits the Christ Child holding the cross. Shown in his human manifestation, the child is a symbolic reference that Christ is ready to descend to earth to fulfil his sacrifice. 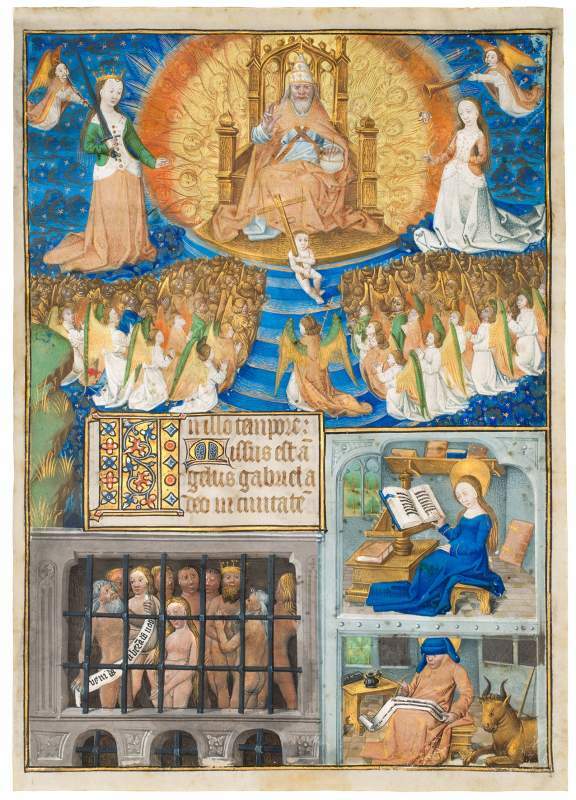 The entire Book of Hours, along with its newfound leaf, is currently on display at the Morgan Library & Museum, as part of its exhibition Now and Forever: The Art of Medieval Time that runs through the 29th of April 2018.